If ever there was a time for a pipe in your house to freeze, the winter of 2014-15 was it. It was very, very cold for long periods of time, and there were extremely windy days as well. If nothing in your house was affected by the weather this winter, you can stop reading now…or not. We have seen all sorts of reasons for pipes to freeze, and many of them involve human error- your house may be subject to one of these conditions in the future and I hope we can help you avoid the disaster that is a freeze-up. Water is weird stuff- it is a liquid that gets less dense when it turns to a solid. That’s why ice floats, but more to the point here, when water freezes it gets bigger– it expands and that expansion is pretty unstoppable. I have seen every cast iron radiator in a house in Boston burst by ice. Those folks were lucky that the house didn’t start to thaw out before they caught the problem. About the only thing worse than having your house freeze is having it freeze and then thaw so the water now runs out of the breaks and finishes destroying the house that way. Air leaks at the basement sill. The sill is the big horizontal chunk of wood sitting on your foundation, on top of which the rest of the house is built. Nowadays, the junction between the masonry and the wood should be well sealed, which is easier to do with a concrete foundation than with a fieldstone or rubble one, but earlier concrete foundations also have voids and nothing sealing them to their sills. In New England, our old stone foundations have crumbling mortar, missing pieces and great whopping cracks where the buildings have settled, not to mention unplugged holes from the removal of oil fill pipes, roof drains and outside faucets. Place a pipe in the laser of cold air coming through one of these penetrations and it’s no wonder the pipe freezes. 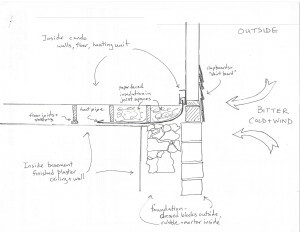 Add “insulation” to the basement (see drawing) in an ignorant way and you have guaranteed disaster by actually insulating the pipe into the cold. A majority of your pipes have to pass along the outside walls of the house, because that’s where the radiators, kitchen sink and bath fixtures are, so they are susceptible to abuse by bad insulators. Proper air sealing of your sills is a number one way of protecting your pipes and saving energy. Basement windows and doors. As our heating equipment gets less wasteful we lose a source of heat in our basements. The old 30’s converted coal burner and great honking pipes left from the gravity circulation system used to pee off enough heat to keep everything from freezing, but now the boiler has some insulation on it and new pipes have a lot less surface area; the cold entering through the rotted, uncaulked, cracked and (you know who you are) broken paned windows can reach the pipes passing by and freeze them but good. Likewise the un-weatherstripped door which lets the wind whip the cobwebs into a frenzy. The water pipes passing over that door have no chance on a 5°F day. There are good people whom you can hire to glaze the windows, or better yet, put in insulated, sealed, double paned numbers that will keep the cold out. The same folks can improve your basement doors so that your heat will stay in and the pipes will stay warm. Piping in former porches or overhanging bays. That porch used to be outdoors, hanging in space, nothing below it to keep it warm, then someone closed it in, but it’s still hanging out with nothing below to warm it. We’ve seen heating pipes left out in the open below former porches, water pipe stapled to the bottom of floor joists and left with only lattice closing off the perimeter. Even if the space is fully closed in, is it fully insulated? The more exposed surface a room has, the greater the heat loss and the larger the risk of freezing temperatures at the perimeter (where the pipes are). Piping in and above crawl spaces. Much the same as above. If even a small stretch of pipe is exposed in an unheated/ drafty crawl space, that piece can freeze. 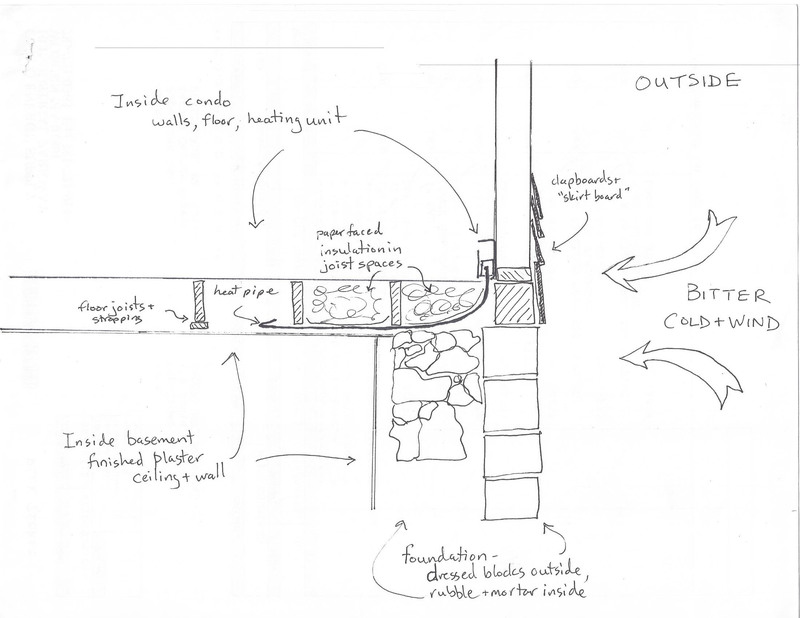 Frigid air from a crawl space can enter through cracks in floor boards and joints between floors and walls (where the pipes are). Human error. The worst thing we do is set our thermostats too low on very cold and especially on windy days. If you feel the walls facing the outside on such a day you will notice how cold they are, especially if there is no insulation. The inside of the outside facing walls is colder than the middle of the room where the thermostat is. Much colder. Wind causes even more heat loss through those walls. (You know how the weather people are always talking about wind chill? It works for buildings, too.) Things like heating pipes and kitchen water pipes will be vulnerable long before the thermostat knows there’s trouble. It is much cheaper to pay for the heat to keep the room at 65° than it is to replaster the house. And replace the floors. And the radiators. And the sink traps and toilet tanks, etc., etc. The laws of thermodynamics apply to us equally, and as always, ignorance is no defense. If you fall into one or more of the categories listed below, you are a likely scofflaw. Pay attention, the fines are brutal. Winter vacationer, particularly February school vacation, when the weather may fluctuate between mildish and very cold, and you may be tempted away from thermostat vigilance. Students/ new tenants. May be unaware of laws of thermodynamics. May not focus on their responsibilities to the building vs. the heating bill. Folks from places down South, including equatorial climes. If you have never experienced winter, you will have no idea what can happen to a house when it gets too cold. First time homeowners/ owners new to a home. You won’t know the peculiarities (which cabinet doors to leave open, which faucet to leave a drip) of a new home until you’ve spent a winter in it. It’s a good idea to ask the previous owners if there is a protocol for avoiding frozen pipes in the house. Renovators. Beware the contractor who tells you you won’t need that heat in the kitchen, or bathroom, or entry hall with the second floor bathroom water pipes running through it. Nest thermostat. Having a Nest thermostat does not give you a free pass to the Land of Ignorance. You need to think about what the temperature is throughout your house. The Nest doesn’t know about anything but what’s right in front of it. See thermostat section in Knowledge for more thoughts on the Nest. Insulate professionally, insulate, insulate. Insulate the perimeter, heat the interior. Warm hat, coat and mittens, good lunch in the stomach. How else can I say this? Run piping in heated areas only. Reroute pipes that constantly freeze. Some day, someone will forget to leave the cabinet door open, or the heat tape plugged in, or the hot tap running and that sucker will freeze and break again. Why pretend otherwise? Fingers in the ears is more expensive. Add heat to your basement. Yes. Especially if you change to a high efficiency heating system that keeps its heat to itself. Your first floor will attempt to heat the basement, because hot goes to cold. If you insulate the basement ceiling to keep the first floor heat in, you will exacerbate the cold in the basement and put the basement piping at greater risk. Frost alarm. For very little outlay, you can get a device that attaches to your phone and will call you when the temperature in your house drops below 40. Home security systems may have an option like this. Your Nest and other thermostats of that type will send alerts to your phone that the temperature has dropped below the desired point. Get a real (reliable) human being to check on your house in cold weather. This one is the most foolproof. Have the person check in every day you are gone. Takes 5 minutes. Bring them back a nice gift. I cannot tell you the amount of damage a frozen house can sustain, except to say it can approach a tear down. Once more- seal and insulate the outside, heat the inside, move vulnerable pipes to a safe place, have someone check to be sure the heat is on while you are away, and your house will be safe from damage.